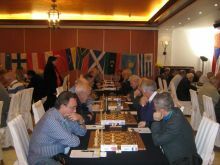 Round 7 of the World Seniors Chess Championship was played in the 5 star Galini Hotel in Kamena Vourla, Greece. The women players of the World Senior Chess Championship are putting up a real show for the medal places. One more time the section was full of surprises, while the top contenders constantly change their positions. After today’s R7 WFM Ankudinova, WGM Fatalibekova, and WIM Titorenko share the lead with 5,0/7. While Ankudinova and Fatalibekova drew their game, WIM Titorenko is back to the first position after defeating with black WGM Strutinskaya. 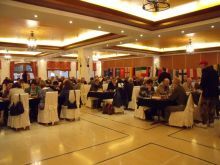 GM Nona Gaprindashvili was held to a draw by WGM Khmiadashvili and WIM Melashvili drew with WIM Beltz. IM Jens Kristiansen took the lead in the open section. He defeated the R6 co-leader GM Yuri Balashov and jumped into clear first position. The other co-leader of last round and rating favorite of the tournament GM Anatoly Vaisser signed a draw with the legendary GM Evgeny Sveshnikov. They now share the second position with the winners of R7 GM Vladimir Okhotnik and GM Yrjo Rantanen, all with 5,5/7. IM Jens Kristiansen half a point clear of competitors on top of the table with 6,0/7. IM Jens Kristiansen is a legendary Danish player, whose major career achievements were in the years 70s, 80s, and 90s. He is 3 times national champion (1979, 1982 and 1995) and 3 times silver medalist (1978, 1980 and 1986). 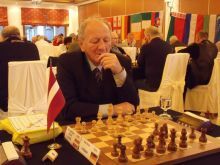 Between 1978 and 1990 he represents Denmark 4 times at Chess Olympiads and once at a European Team Chess Championship. IM Kristiansen’s first major international success comes in 1997 when he wins the North Sea Cup. After come two titles from Gladsaxe, a medal from Reykjavik 1981 championship Nordic countries, and first places in Ballerup 1985, Gothenburg 1989, and Taastrup 1995. 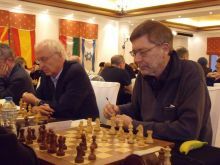 His last major international success comes in 2006 when he finished shared first at the 9th Open Banyoles with GM Korchnoi, GM Hillarp Persson, GM Tiviakov, IM Lapshun, and IM Fomichenko. The following year he shared 2nd place at the Danish national championship together with 5 more players.